It's hard not to like Fred Hembeck. At least, I find it hard not to like the guy, but then I do know people who look at his stuff and remain fairly stone faced, so I guess I'll clarify that - if you've got any form of a sense of humour then it's hard not to like Fred Hembeck. 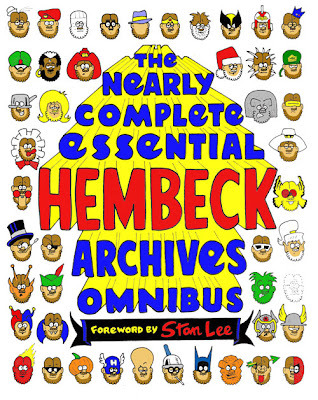 If you take your comic books seriously, and think that those characters are real then you're probably not a fan of Hembeck. More's the shame because Fred loves these characters too, which is why he does what he does. When I launched the parent site to this blog back in 2003 I never expected that it'd still be going five years later, but there it is. The idea for the site was that I might be able to sell some of my collection, eBay screwed that pooch for good. In quick time the site became a repository for interviews, articles and a pile of other good, fine stuff that I was doing at the time. Via the site I met a lot of people, some good, some bad, and some are now lifelong friends, so if the site only did that then it did more than I expected it to.